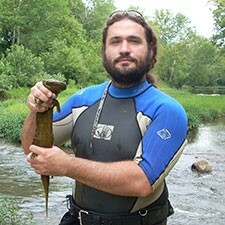 Dr. Shem Unger holds a giant salamander. ​Giant salamanders are sensitive to changes in their aquatic environment. Perhaps one of the most significant factors influencing their livelihoods is the quality of their habitat. In previous podcasts, we heard how water temperatures can influence hellbender immune system and foraging ecology. In this podcast, our guest host, Dr. Steve Kimble, will be interviewing Dr. Shem Unger regarding his work on the effects of sedimentation on the physiology of juvenile eastern hellbenders.